The western bank of the Garonne River, commonly referred to as the “left bank,” north of the city of Bordeaux, produces the region’s most profound Cabernet Sauvignon–based wines, such as Château Mouton Rothschild, Château Latour and Château Lafite Rothschild. It includes the famous appellations of Margaux, St-Julien, Pauillac and St-Estèphe—not generally sources for value wines—as well as less prestigious appellations such as Haut-Médoc, Listrac and Moulis, where many good values can be found. Most Bordeaux wines are blends of two or more of the five Bordeaux red grape varieties: Cabernet Sauvignon, Merlot, Cabernet Franc, Petit Verdot and Malbec. On the left bank, Cabernet Sauvignon is the dominant grape, producing structured, tannic reds with distinctive flavors of cassis and cedar, and usually a kind of austere elegance. Cabernet Sauvignon’s formidable tannins (the compounds in red wine that give it a somewhat drying astringency, but also allow it to age for years) can certainly make a wine seem reserved. But when it’s paired with an opulent main course—like Marcia Kiesel’s roast duck with citrus pan sauce—the result is a nearly perfect balance. Even in a modest vintage like ’02, this harmonious red from a dependable château is a pleasure to drink. Liversan, renovated in the late 1990s, produces a supple left bank red with red currant and spice notes. This cassis-scented wine comes from an estate in the hills of Puy de Menjon, the highest point in the Médoc. 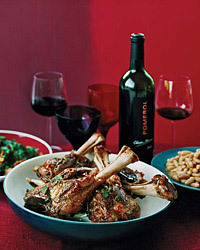 A touch of Petit Verdot deepens the color and gives a floral scent to this dry, berry-inflected red. The Gardinier family of the renowned Château Phélan-Ségur is the force behind this graceful, cedary Bordeaux.